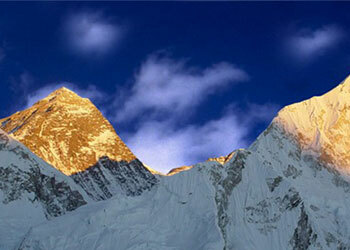 Everest Base Camp Trek takes you to the breathtaking close-up view of the ‘king of all of the mountains’ – Mt. Everest [8848m]. Since 1953, when Sir Edmund Hillary and Tensing Norgay conquered it for the first time, this region is attracting trekkers from all over the world. Everest Base Camp trek (16 days) offers most magnificent mountain panoramas, lush Himalaya’s flora and fauna and a wonderful hospitality of native Sherpa’s. Everest Base Camp trek adventure starts with an exciting flight from Kathmandu, to Tensing Hillary airport at Lukla. Next, you will be trekking up the Dudh Koshi Valley, surrounded by the soaring peaks and heading towards Namche Bazaar, the capital of the Khumbu Sherpa’s. We will trek along a moderate path where you will experience a first panoramic view of Mt. Everest. Next part of the trip will bring us to Thyangboche Monastery, situated at 3,867 m. The monastery is the largest gompa in the Khumbu region of Nepal with a wonderful 360-degree mountain view. We then descend to the Imja Khola and head to the villages of Pangboche and Pheriche, before arriving near the Khumbu Glacier. During the trek you will experience a wonderful hospitality of Sherpa’s and their traditional lifestyle which will surely amaze you. Furthermore the path of the Everest Base Camp heads to Lobuche with a magnificent views of Ama Dablam, Taweche and next to Kala Patthar [5554m]- a very famous Mt. Everest viewpoint. Finally, at the foot of Khumbu ice fall in Everest Base Camp trek, we will walk at leisurely tempo to return to Namche and Lukla to take a return flight to Kathmandu. For all the trekkers seeking a great adventure, Nepal Everest Base Camp trek is the most recommended trekking route. It brings an unforgettable experience of the overwhelming vistas of the Everest Himalayan chain of Khumbu region, which consists of five of the world’s highest mountains: Mt. Everest (8,848m), Mt, Makalu (8,463m), Mt, Cho Oyo (8153m), Mt. Lhotse (8,501m) and Mt. Lhotse Shar (8,393m). Aside from the beauty of the Himalayas, this area includes natural wonders heritage site indexed by UNESCO. Rich in pine forests of rhododendron (Nepalese national flower) and an endangered species of birds and animals this trek is truly unique and memorable. 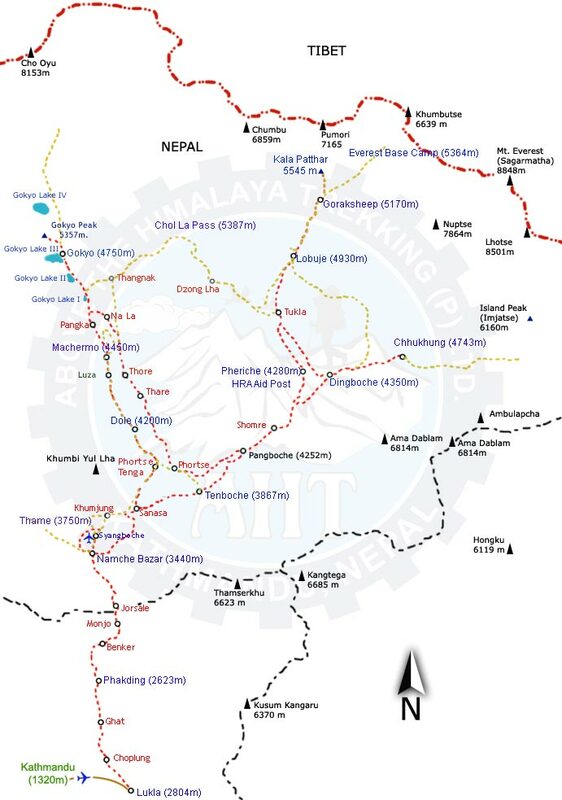 Trekking at Everest Base Camp is feasible for the entire 12 months. However due to the climate and the weather conditions we recommend to do it from the start of March to mid-May and then again from the start of the September to mid-November. During the winter months snowfall may cause difficulty in traveling. On the other hand, summers are wet and the extraordinary peaks are frequently lost in the clouds. Please read the below itinerary highlights and contact us directly for booking a trip of your life. Trip Snippets:16 days, 4 night’s hotels, 11 nights Lodges, Breakfast in Kathmandu, 3 meals a day ( breakfast, lunch and dinner) during the trek are included. Day 01: - Greetings at Kathmandu Airport, Transfer to hotel. We will meet you at Kathmandu Tribhuvan International Airport and you will be transferred to hotel. Where you will have your time to freshen up and after that, you will be invited to visit our office for a briefing about your program. You will have meeting with your trekking guide and discuss about the equipment needed for the trekking and we will process for the trekking permits. If you arrive at night we will have same discussion in next day morning after your breakfast. Day 02: - A full day sightseeing tour of Kathmandu, the capital valley about 7 hour tour. The very next morning, after breakfast you will be taken for a full day sightseeing tour around Kathmandu valley. You can visit center of pilgrimage Pashupatinath Temple and Swyambhunath, very ancient and essentially enlisted in UNESCO World Heritage sites. The biggest Buddhist Stupa at Boudhnath might make you feel calm and peace and visit Patan the city of fine arts and Durbar Square is full of Hindu temples and Buddhist monuments. On journey back to hotel, you can explore the local areas, gullies and lifestyle. After your dinner, you can perhaps take leisurely stroll through the famous streets like Thamel and Durbarmarg. Meals included: Breakfast. Early morning we fly from Kathmandu to Lukla via mountain flight of about 40 minutes scenic flight. With clear weather, we get spectacular views of the mountains, including Everest as we enter deep gorge of the Dudh Kosi valley. You begin your trek from Lukla, along the way you will have a view of Mt Nupla (5885m), Kusum Kangaru (6367m) and Kwongde Range. We then take an easy walk for about two hours to Phakding village for the overnight stop and the rest of the time stroll around the village for local knowledge. Day 05: - Acclimatization day in Namche Bazaar. hike up to Everest view hotel and Syangboche Airstrip. Today is an acclimatization day. you can better do short hiking to little high altitude will help you to acclimatize your body. We start our trek with the pleasant walk through the forest with the magnificent view of mountains. We follow a spectacular path that traverses around the hillside high above the Dudh Kosi River. After walking one hour you will arrive in Phungithanga. The trail climbs past some water-powered prayer wheels and begins a sustained climb through a forest of tall, mature rhododendrons. Look out for musk deer and Himalayan tahr among the trees. The start of the Tengboche (3870m), the village is scattered across a wide, grassy saddle below a crescent-shaped ridge covered by scrub pines and firs. From the viewpoint at the top of the hill, there are awe-inspiring views of distinctive peaks like Amadablam (6856m), standing proud of the massif containing Everest (8848m), Nuptse (7861m), Lhotse (8501m) and inspiring views of Himalayan giants. We visit the Buddhist Monastery at Tengboche, the largest in Khumbu region. After crossing the suspension bridge over the Dudh Koshi River trek onwards to the Kyanjuma the junction of the trinity ways to Gokyo Valley, Khumjung village, and Namche Bazaar. Dense wildlife of some species of Pheasants, Himalayan Griffons, Musk deer and wild goat can be found in abundance inside the rhododendron forest. Evening explores the small surrounding area with magnificent scenery.